Take a walk out to sea without getting your feet wet! The Friends of Rockland Harbor Lighthouses open this landmark lighthouse as volunteers are available. The lighthouse sits at the end of a 7/8-mile long breakwater and features an attached keeper’s house. 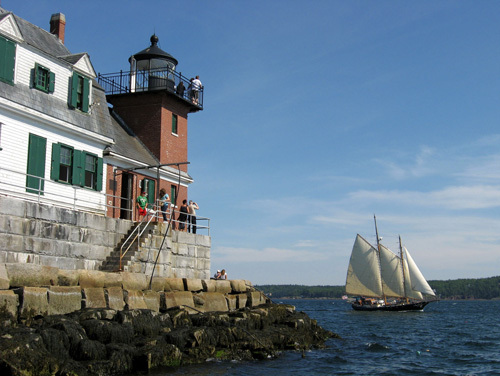 Visitors can walk through the beautifully restored dwelling as well as climb to the top of the lantern for a bird’s eye view of the harbor with its working lobster boats and historic schooners. On any given day, a walk out the Rockland Breakwater to the lighthouse will offer views of more than the marine traffic that calls the harbor home. Visitors are also treated often to the sightings of shorebirds and harbor seals in and around the stone breakwater – and occasionally, dolphins as well. Grounds are open sunrise to sunset. Lighthouse tours are volunteer dependent…please visit the Rockland Breakwater Lighthouse Facebook page for any announcements. All tours are also weather permitting. There is a suggested donation per person for visiting the lighthouse. Height Requirement: Our younger visitors must be taller than 42 inches to climb the tower. There are no restroom facilities at the lighthouse. Please utilize the restrooms adjacent to the parking lot. Wear comfortable shoes. High heels, flip-flops, or other open back footwear are not permitted when climbing the tower. Use caution when walking the breakwater and then again when climbing the steps inside in the tower. Be prepared to climb a seven wrung ladder to enter the lantern room. Use the hand railing where appropriate. Dress warmly. The lighthouse is located almost a mile out into the harbor. Expect higher velocity winds and lower temperatures as compared to the parking lot. Turn onto Waldo Avenue (while traveling north toward Camden on RT 1, this will be a right turn and while traveling south on RT 1, this will be left turn.) Go .5 mile on Waldo Ave, turning right onto the Samoset Road. Samoset Road ends in the small parking area for the Breakwater. The Breakwater, to the left of the parking area, leads about .8 miles to the lighthouse.